Great summer salad. Double ingredients for a potluck or the buffet table. 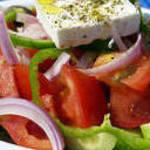 This site is for salads - green, veggie, fruit, meat, poultry, tuna, pasta, grains, etc., and salad dressings.